Catalyst says its new waterproof Apple Watch case is a world's first and is designed to meet or exceed IP68 standards, meaning it is both dust tight and can withstand immersion in liquid beyond 3 meters. The case also meets MIL SPEC standards for drop protection, adding another layer of security for users with active lifestyles. From the looks of it, Catalyst's case features a raised bezel area that helps prevent scratches on Watch's screen when dropped on a flat surface. Importantly, the added water and drop protection does not come at the cost of device access. Users can operate the touchscreen display normally, while pushers and a special rotating crown offer access to Watch's physical controls. There are also ports for speaker output and microphone input, key features that enable voice calls, alerts, haptics and more. It appears, however, that Catalyst's case must be used with the provided nylon NATO quick-release style wrist strap, as Watch's magnetic band slots are inaccessible. 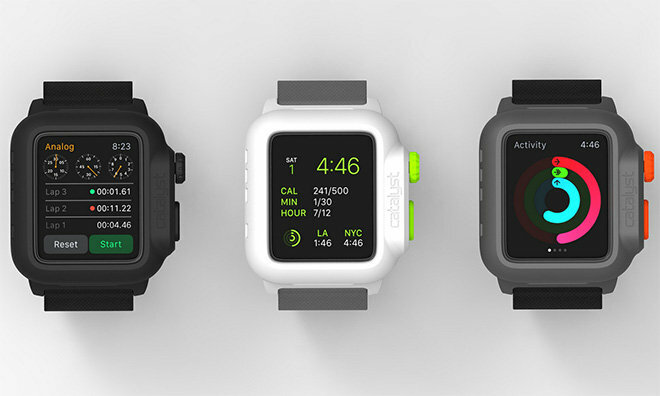 Catalyst's waterproof Apple Watch case is limited to 42mm Watch versions and can be preordered for $59.99 in three color combinations: all-black, white housing with green controls or grey housing with red controls. The company expects to start shipping in November. In addition to Apple Watch, Catalyst also announced a waterproof case for iPad Air, a MultiSport Mount for iPhone 6 and 6 Plus and a belt clip add-on for its iPhone case lineup.